Drive Bar. Now XYplorer offers a smart drive bar that flexibly integrates into the toolbar. The availability of drives is reflected in real time, and the individual drive buttons function as drop targets. The Hard Drives Bar (showing all available hard drives) integrated in the Toolbar. You can choose between hard Drive Buttons, and soft Button Groups (where only the currently available drives will show up as toolbar buttons). You can also freely combine both. Drive Buttons: Under Tools | Customize Toolbar | Available Buttons you find buttons for all drives A: to Z: which you can use to build your own custom Drives Bar section within the main toolbar. The icons react on adding or removing of removable drives if Auto-Refresh is enabled. The buttons' tooltips show the drive display captions. Right-clicking the buttons pops the drive's shell context menu if the drive is available. Last not least, the buttons function as drop targets, i.e. you can drop files on them to copy/move them to the drive's root. Use the right mouse drop menu for further options. No USB stick plugged in. After plugging USB stick in. The icon auto-adjusted to the new situation. Drive button groups in Customize Toolbar | Available Buttons. Note how the list is filtered by "drive"; this is another new feature in v10.10. After plugging USB stick in (drive G:). The icon auto-appeared on the toolbar. Tab Bar. Now you can show a New Tab button on the tab bar of each pane. It lets you quickly open a new tab. Turn it on/off in Configuration | Tabs | Show 'New Tab' button. Sort Order. Now you can sort filenames primarily by base, and secondarily by extension. This is the Win7 way and it's usually preferable to the XP way (sort by full name). Empty Folder. 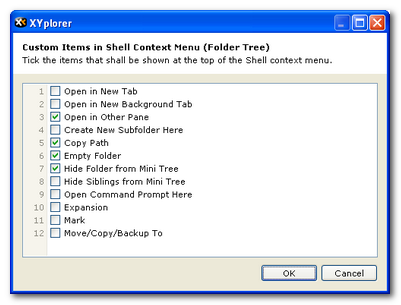 The context menu of folders in Tree and List now optionally features a command to empty the right-clicked folder. Tick Empty Folder (and whatever else you like to have in your right-click menu). Note that Empty Folder is as well available for the right-click menu of folders in the file list. 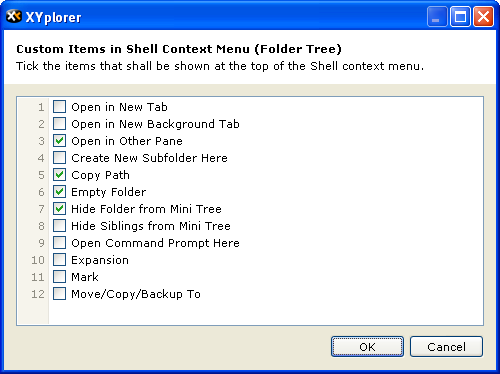 Simply tick it in Configuration | Extended | Custom items in shell context menu | File List. Custom Tab Icons. Now you can customize the icon of each Tab. Simply append any file spec to the caption of the tab, i.e. to the name you give to a tab by the Rename Tab function (found in the tab headers context menu), separated by a | (pipe). It can be an icon file or any other file or folder with associated system icon. XYplorer native variables, environment variables, and portable paths are supported. Custom Catalog Icons. Now you can customize the icon of each Catalog item. Simply append any file spec to the Caption in Properties, separated by a | (pipe). It can be an icon file or any other file or folder with associated system icon. XYplorer native variables, environment variables, and portable paths are supported. The caption "Hash Check|E:\Test\Kiss.ico" defines the caption (Hash Check) and the icon (E:\Test\Kiss.ico) for that Catalog item (which calls a one-liner script to compare MD5 checksums). This is how the item "Hash Check" turns out in the Catalog. Custom Openwith Icons. Now you can customize the icon that's shown for each item in the Portable Openwith Menu (POM). Simply append any file spec to the Caption, separated by a | (pipe). It can be an icon file or any other file or folder with associated system icon. XYplorer native variables, environment variables, and portable paths are supported. Append modified date is my favorite POM script, I use it many many times each day. The pink heart icon makes it stand out from the other scripts.